When I started out building projects on a larger scale, I thought I had the proper tools. I couldn’t have been more wrong!! I didn’t think investing in my tools was that big of a deal. I would soon find out that it really does matter what is in your tool bag. I didn’t want to spend the money on tools. I like OTHER things. Shoes, bags, and home decor to name a few. I thought that I could get by with what I already had. I quickly realized that you really do get what you pay for and nice tools actually make the task at hand more fun! 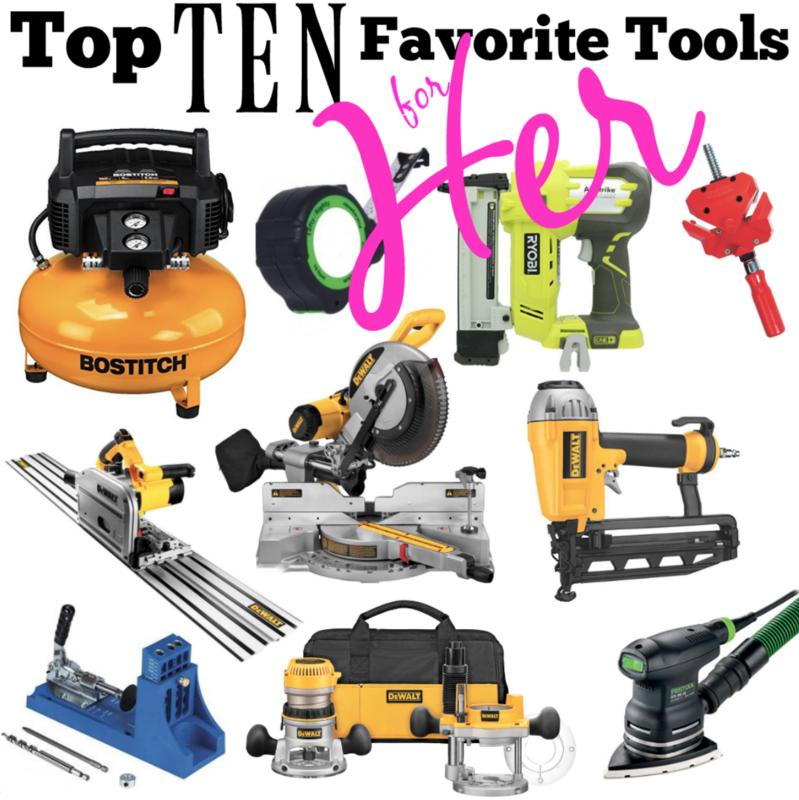 I am going to tell you my top ten favorite tools! Over the last couple of years I have added lots of tools to my garage. And I use them!! I would be the first to admit that I am no building expert, but I have done enough of the kind of projects, like here, here and here that I feel I can give you a qualified opinion. I have a list of my favorite tools and ones I find myself grabbing often. I love how empowering it feels to know that I can build something if I want it. I don’t have to wait for my husband to have time (he hates DIY) and I don’t have to pay someone else $$$$ to do it for me. It doesn’t matter if you have a great collection of tools already or if you are just starting out. I tend to lean towards Dewalt. The price point is good for good tools and they have not disappointed me yet!!! You may be on the fence about one of these or get overwhelmed by the sheer thought of any of these tools sitting in your garage. Either way, let me introduce you to my favorites and let you know what I think! With Christmas coming up, there may be something on here that may need to be on your WISH LIST!! Like, now. You can “click” on the pictures to be linked to the product. The first place I would start is a good miter saw. With a miter saw you will be able to cut your wood at various angles. I did not buy a compound miter saw and wish I had spent a little more money for the sliding part but I have made due and I probably won’t buy one because I already spent good money on the one I own. Whether you get a compound miter saw or not, make sure you get a decent size one with a blade like a 12″. You will be sorry if you get anything smaller. You won’t be able to cut what you want and you will be very limited! While the big box store will do the big cuts for you, the big box store will not miter your cuts for you. You could opt for a miter box, but I find that takes a long time because it is a hand saw and you are limited to 90 and 45 degree angles only. Next I would get a nailer. A 16 gauge nailer that takes a variety of sizes of nails is perfect. You can do so much with it like baseboards, shiplap or floating shelves. You can also get an 18 gauge nailer that accommodates a smaller nail perfect for smaller, more delicate jobs like smaller moulding. For either one of these you will need to get a compressor to attach to your nailer. With special, inexpensive attachments you can use compressor for more than just woodworking. I use it to pump up bike tires, large pool floats and have even used it on a car tire!! My Track Saw is a very loved tool and I use it ALL THE TIME! I didn’t want to buy it. I really didn’t. But, when I started building the craft room, I started with a circular saw and a guide. It was a disaster! I didn’t want a table saw as I don’t have an actual workshop and the track saw just made sense. It wasn’t as intimidating as a table saw and I feel, for me, it is really safe to use. If I let go of or stop the saw the blade retracts back into the saw. I love it so much!!! It is so simple for me to just pull out my track, measure my cut, set my saw at the right depth and cut quickly. I used it for this shiplap, too, and it was really quick and easy! I can hook it up to my shop vac and avoid a huge mess. LOVE! You wouldn’t think that a tape measure would be a big deal but IT IS!!! I love, love, love this tape measure and have a hard time going back to any other. If I lose it, I always replace it immediately. I think someone else loves them, too, because I set mine down at HD and someone walked off with it. Things I love about this tape measure 1. you can read it left to right or right to left 2. It has the actual numbers on it not just lines so it makes for a quick and accurate measure 3. you can write down measurements right on it and take it right to the saw! Also, if I wear it into HD on my pocket I look legit and I look like I know what I am doing. Corner clamps are awesome! They are a really important part of building to me. I am usually building projects by myself so they are the extra set of hands that I can always use whenever I am building anything that needs to join two corners. They don’t have to be used for a big project either. You can use them on simpler projects like a frame for a canvas print. Sandra at Sawdustgirl.com introduced me to them. I love my router and pocket hole jig. I use them on their own and I use them together whenever I am building drawers. I use the router for a variety of projects like adding a decorative edge to a counter or making a window sill. When building drawers I simply run them along the wood to create a dado and then use the pocket hole jig to attach the sides together. You will use these for so many other things, too. You can get the router I have with an attachment that goes with the tracks for the track saw to ensure your router is running in a straight line. Get yourself a good sander that has an attachment for the vacuum! I hate sawdust everywhere! It is so messy!! A good corner sander is such a great tool to have. I have a round sander and a corner sander. I like both but if I HAD to choose one I would get a corner sander only because it is reaches more places. My stapler is a cordless stapler. It has been good to me. I use it for stapling on the back of a cabinet or upholstering a piece of furniture. I may have recently seen me use it when I did my teenage son’s bedroom makeover! It seems to work just fine for me and the battery runs a good length of time on this tool. I haven’t found a good drill that I am in love with yet. The drill that goes with this line of stapler is powerful and lasts a long time, also, but it is really big for my hand so my hand gets very sore using this for a long period of time. Still searching. If you have a favorite I would love to hear about it in the comments!!! Please Share!!! I am always looking for a good tool that will make my DIY life a little better and someone might need it on their Wish List, too!